The following learning objectives are designed for an introductory course on Operations Management. Within this competency there are seventeen competency elements. The types of support operations vary, and include management and direction of such things as public access, specialty courts, juries, defense attorney appointment, dispute resolution services, and emergency preparedness. Each one of these elements constitutes a discipline within itself, and could be the subject of a stand-alone comprehensive course. These disciplines are therefore provided in summary fashion here; court leaders are encouraged to continue research and learning within each area and based upon job responsibilities. Identify individual learning needs for the elements within the Operations Management competency. 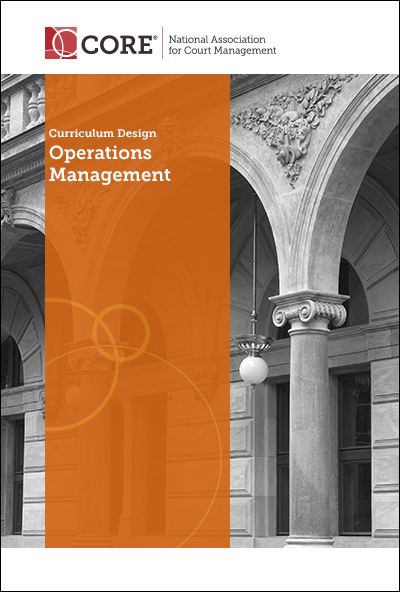 Gain familiarity with the competencies within Operations Management. Describe the relationship of the Operations Management elements with regards to constitutional and due process requirements for court litigants and users. Create and produce a program plan for a specialty court, to include program goals and objectives, partners and collaborators needed, and measurable program outcomes. Identify expectations and needs of self-represented litigants (SRL) and draft an SRL Policy for your court. Evaluate the priority or critical court operations necessary should there be a business interruption or emergency, and list preliminary steps and actions needed for business continuity. Assess which performance measures or metrics are needed to document and report on the business outcomes of the Operations Management elements. Identify the impact and relevance of all other Core competencies in the Principle, Practice and Vision modules. Construct a personal action plan, to include a priority listing of Operations Management elements for your court’s executive leadership team to address and/or research for implementation or enhancement. As we consider the array of functions and services included in this competency, it is illustrative to categorize these services in specific areas. Some of the elements within this competency are required by laws and statutes as part of the constitutional due process and rights afforded for court parties (examples include access to a jury trial or the appointment of defense counsel). Some relate to specific services that a court may provide (probation services or specialty court operations). Still others relate to public access to the court, to information and records, and some relate to the court’s ability to ensure the operational infrastructure is operational (business continuity planning, and technology operations). Interestingly, some of the functions and elements may not be operated directly by the court. Court managers, however, need to be familiar with the nature of these operations. The listing below depicts the Operations Management elements, grouped under categories relating to their function. Of note, items marked with an asterisk (*) indicate that, in some courts, the function or elements of it may not be directly under the responsibility and supervision of a court, and may be delegated to another entity or agency.